London. Hanging by a thread. Most of the time things just work. We don’t question them. We take them for granted. We don’t see them. It’s the way things are. It’s only when things go wrong that we question them. They become noticeable by their absence. Overhead lines. You never hear announcements about them working perfectly, but to be fair, the majority of the time they’re quietly getting on with the job in the background. Overhead. But the other evening, they jumped from obscurity to centre-stage when they stopped working. It meant that trains couldn’t safely reach King’s Cross. For a long, long time that evening it was a station with thousands of stranded commuters and no trains. Not one. Ignore the 'on time' trains. They weren't. It’s at times like this that you come to realise that it really doesn’t take much to bring these systems to standstill. One simple random glitch can affect thousands of families, ruin plans, cause chaos, cost time and money. More to the point, this father won’t get to say ‘night night’ to his little girl this evening. 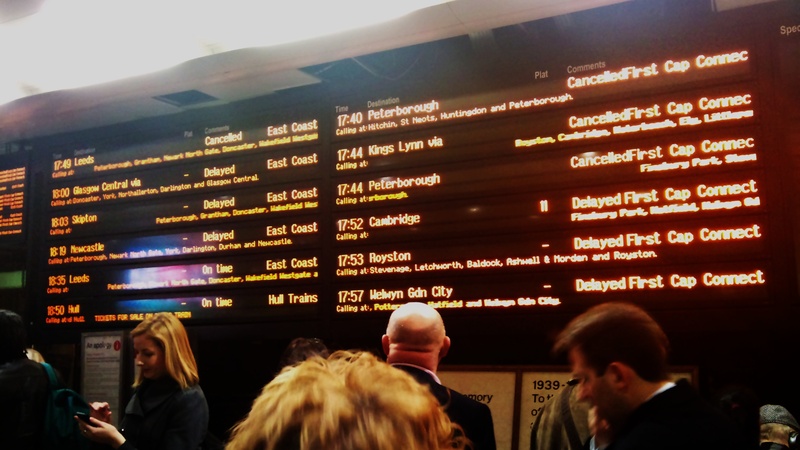 With no trains out of town, your options are severely limited. A guy next to me got his mate’s taxi firm on the phone. No joy. Coaches? Where do they go from? Wouldn’t they be rammed too? A city perhaps running beyond full capacity, London really is hanging by a thread, a fragile set of connections at the mercy of anyone with serious intentions of creating havoc.